then, take about a Table Spoon of Olive oil and rub it BETWEEN YOUR HANDS AND THEN all over the kale – yes absolutely all over (!) so that what you will put on it will stick! Sprinkle on Sea Salt, Gomasio (Garlic and Herb) and Nutritional Yeast – any of those or all of those.. to taste – your taste. Spread the seasoned Kale on a bake sheet or two and place them in the oven and bake at the LOWEST temperature possible – it will take according to the low temperature. Could be 2 hours..
turn it every so often to make sure it all becomes dry and crunchy..
Of course you can prepare your Kale Chips in your dehydrator – there it may take 4 to 6 hours. 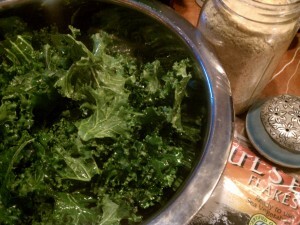 Kale Chips – healthy, salty, crunchy, fatty (healthy fatty) ….just the way we like them. My friend said – “at last I get some Greens into me”. Make a lot – you will like them. In addition to high content of Fiber, conventional antioxidants like vitamin C, beta-carotene, and manganese, kale also provides us with at least 45 different recently discovered flavonoids, including kaempferol and quercetin. Many of the flavonoids in kale are also now known to function not only as antioxidants, but also as anti-inflammatory compounds. Not so bad as a nutrient goes.